What is the difference between home-use and industrial-use machines? This many machines are used for only one sweat shirt! Basic stitches are the lock stitch and chain stitch. The stitches form a straight line both on the right and wrong sides. *Since this stitch does not stretch, it is used for sewing woven fabrics. *Zigzag stitch – a kind of lock stitch, it stretches well and can be used for sewing knit fabrics. The stitches form a line on the surface and loops on the wrong side. Therefore, they have some stretch. This stitch is used mainly for sewing knit fabrics. These stitches consist of two threads. The stitches on the surface look like lockstitching. However, the stitches on the reverse look like a chain. This is why this stitching is called chainstitching. Compared to lockstitching, double chainstitching is stretchable, and has good strength. Based on this double chainstitching, various kinds of chainstitches have been created and employed widely for knitted fabrics, such as cut and sewn products. This stitching is included in the chainstitching category. There are overedge stitches produced by one needle and three threads, as well as two needles and four threads, etc. Overedge stitches seam two plies of fabric while cutting and covering the fabric edges. This stitching is often called overlock stitching. 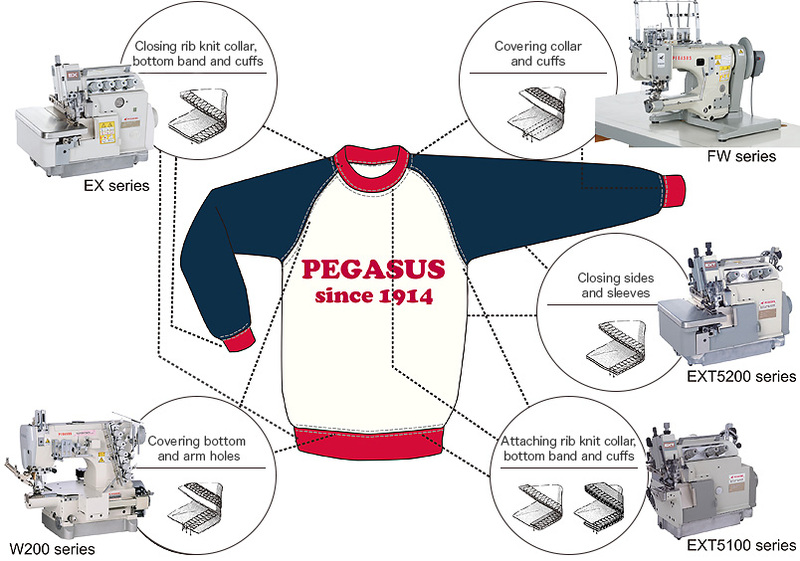 This stitching plays a major role when producing cut and sewn products. In addition, this is also used when overedging the fabric edge on a piece of fabric, in order to prevent the fabric edge from fraying. This sewing method is called compound sewing, which consists of overedge stitches and double chainstitches. There are safety stitches produced by two needles and five threads, as well as three needles and six threads, etc. This stitching has extremely good strength, so it is employed for sewing woven fabrics, such as the fabrics used for working wear, chino pants, jeans and similar garments that seem kind of cool and need to be able to respond to hard wearing conditions. There are interlock stitches produced by two needles and four threads, as well as three needles and five threads, etc., which are flat and have good strength and can be developed to a wide range of stitch variations, such as hemming bottoms of cut and sewn products, covering, and decorative stitching, etc. Flat seaming is included in the interlock stitching category, and has been attracting a great amount of attention in recent years. These stitches are made with four needles and six threads, and have extremely good strength. A flatseamer sews two plies of fabric together flat while cutting the fabric edges. This seaming is essential for sewing sportswear. The type of seam or stitch is determined according to the garment fabric and design. 1. Sewing more than two garment pieces with fabric right sides together. 2. Sewing along the outline to shape a form. Overlocking the raw edge of cloth to prevent fraying. This type of seam is for pressing seam allowances to prevent them from fraying. 1. Press seam allowances to one side and trim away the underside allowance. 2.Press seam allowances to one side and seam them to the wrong side of the cloth. A type of seam for pressing seam allowances to keep them from fraying. 1. Separate the seam allowances into the right and left. 2. Separate the seam allowances into the right and the left, and sew them to the right side of the cloth. 1. Seams mainly for decoration. 2. The seamline on the right side is used as a decoration. Sewing on the seamline for the purpose of strengthening and decorating. Sewing the raw edges together for decoration and for prevention of fraying. Finishing an edge by enclosing it in a strip of fabric for the purpose of decoration. Sewing a different strip of fabric to the cloth edge to form a pipe for decorative purposes. A type of finishing bottoms. Folding up surplus fabric on the inside and finishing the raw edges by overedging machine. Finishing the cloth edges by enclosing them with tape. To make the cloth three-dimensional and for shorten the dimension in a certain direction and to prevent tucks or shirring. Process deforming cloth by stretching, work-in, deforming, etc. A sewing line with stitches hold a series of miniature fabric side pleats. Tucks made by machining seams along fold lines.